When the chocolate is longer than the actual psalm. David’s back with today’s psalm, which is about getting in touch with your inner child. When he wrote this psalm, the expression “getting in touch with your inner child” didn’t exist, because the English language didn’t exist. David assembled a new simile to get across the idea of the inner child: “Surely I have composed and quieted my soul; like a weaned child rests against his mother, my soul is like a weaned child within me” (131:2). And the thing about your inner child is that you have to be the parent to it. When it gets too excited, you have to be the one to compose it and quiet it. David’s soul is leaning against him, cradled in his arms, like he’s a soul-mom. I’m familiar with this sort of thing, although I’m not the greatest parent to my soul. Just yesterday, I was thinking about how much of growing up is just learning to sleep. The sun goes down but you’ve got things on your mind, on your soul, and you’ve got to get that soul to chill so you can get rested up and actually do those things tomorrow. So you learn techniques to calm your soul down. Through trial and error, you find mental activities and breathing patterns and generally things that work. I’m not quite sure how to tie it in with the soul-child simile, but the first verse struck me too. David states: “O Lord, my heart is not proud, nor my eyes haughty; nor do I involve myself in great matters, or in things too difficult for me” (131:1). That middle line is literally “Nor do I go after great matters.” Man, David, don’t mention that one in a job interview! We prize ambition and applaud those who embrace difficulty, but David, even as the King of Israel, knows his limits. Some things are best left to God. And with the final verse, David encourages his entire kingdom to join him in leaving the biggest things to God. “O Israel, hope in the Lord from this time forth and forever” (131:3), he tells them. He wants to live in a nation marked by its confident expectation that God will deliver on the things that only he can do. He wants to live among people who are good parents to their souls. Posted in Daily Reading, Old Testament, Psalms.Tagged bible, children, christianity, David, hope, humility, peace, Psalms, scripture, spirituality. 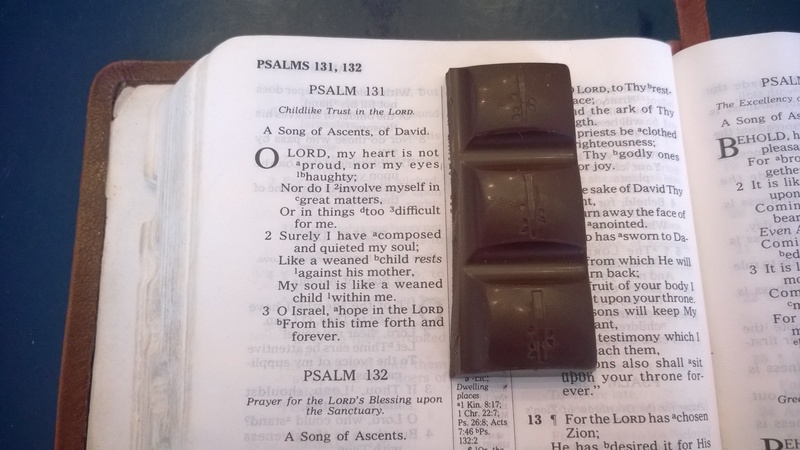 “When the chocolate is longer than the actual psalm.” — I love that! Now if I get my hands on some chocolate longer than Psalm 119, then I’ll be happy. This Psalm became real to me when I first experienced calming a wailing infant as I held her close and rubbed her back. It’s funny, reading this I never thought about the role that *I* play in calming and composing myself. I always read this Psalm picturing God being the one to hold me when I’m having a freak-out. But I think you’re quite right to point out that we are given the grace (and responsibility) to be good stewards of our bodies, emotions, etc. Still, He’s the ultimate parent to me and to my children, and I thank Him for that! I agree. It occurred to me earlier at work: maybe I should add something about how the simile is flexible enough to accommodate various interpretations of who the mom is? David is apparently continuing in the tradition of Moses here, as it wouldn’t be the first time we’ve seen God as the Divine Cosmic Mom. This what Moses says about Benjamin but is a picture of the gift of relationship Jesus has provided for us. “Benjamin” (Binyamin) means "son of the right hand.” Jesus Christ is the son of God, who sits at his right hand, and in him we are also God’s right-hand sons and daughters. Thanks for sharing the verse from Deuteronomy! I also looked up the Hebrew for “beloved,” which is yadid. I have no particular insights into it.